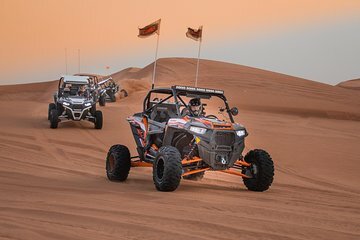 Get behind the wheel of a Polaris buggy and explore the sand dunes outside Dubai. The 34 mile (55 kilometer) route takes drivers on a thrilling ride through picturesque desert landscape. Tours are led by expert guides, but you do the driving—each buggy seats two people. Safety gear, refreshments, and hotel pickup and drop-off are included.